Aluminum surface treatment methods are generally anodizing, electrophoretic coating and powder coating three treatment methods, each method has its own advantages, occupies a considerable market share. Among them, powder spraying has the following seven significant advantages. The process is relatively simple. Mainly due to the improvement of the automatic precision of the main equipment and the microcomputer control can be achieved for some major technical parameters in the production process, so the difficulty of process operation is effectively reduced, and the auxiliary equipment is greatly reduced. The yield is high. Under normal circumstances, if all measures are taken properly, the generation of defective products can be controlled to the maximum extent. The energy consumption is significantly reduced. In the production process of ordinary anodizing and electrophoretic coating, the consumption of water and electricity is considerable, especially in the oxidation process. The output current of the whole machine can reach between 8000~11000A, the voltage is between 15~17.5V, plus the heat consumption of the machine itself, it needs to continuously use the circulating water for cooling, and the ton electricity consumption is often around 1000 degrees. At the same time, the reduction of auxiliary facilities can also reduce some power consumption. The degree of pollution to water and atmosphere is reduced. The use of caustic soda, sulfuric acid, and other liquid organic solvents is no longer used to reduce water and air pollution. It also effectively improves the competitiveness of aluminum profiles and plastic steel profiles as environmental protection products and accordingly reduces some production costs. The labor intensity of workers has been significantly reduced. Due to the use of automated assembly line operations, the hanging method and the use of fixtures have been significantly simplified, increasing production efficiency and reducing labor intensity. The surface quality requirements for wool have been significantly reduced. The powder coating can completely cover the extrusion lines on the surface of the profile, masking the flaws on the surface of a part of the aluminum profile, and improving the surface quality of the finished aluminum profile. Some physical indicators of the coating are significantly improved compared to other surface treatment films, such as hardness, wear resistance, which can effectively prolong the service life of aluminum profiles. Electrostatic spraying is used on the powder coating process. Using the function of the friction spray gun, under the influence of the accelerated wind, the powder particles are positively charged when they are sprayed out of the gun body, contact with the negatively charged profiles, generate electrostatic adsorption, and then pass through high temperatures. Curing also enhances the paint's strength and prevents the paint film from falling off. From the point of view of the process itself, it has highly technology, and the deployment of paints with different colors will produce difference decorative effects. 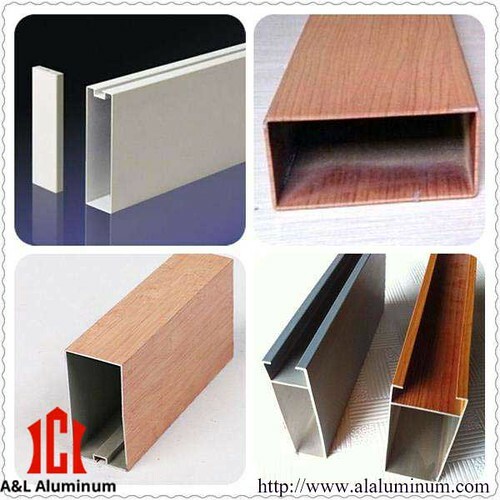 It is more in line with the needs of interior decoration, and it is also in line with the development trend of aluminum profiles in the construction industry. In particular, the combined use of spray profiles and thermal break bridges has made them more fashionable, enabling powder sprayed profiles to have more space for development and also being unreplaceable by other processing methods. We are aluminum manufacturing companies, what’s more, do you want to know fluorocarbon spraying coating? We can give you a better explanation.